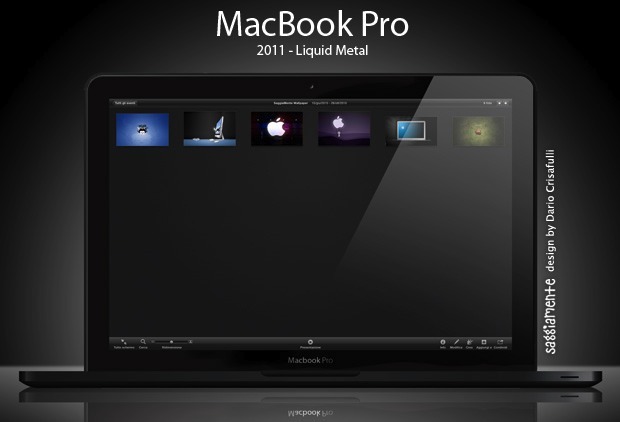 Is this what a liquid metal MacBook Pro might look like? This mockup is based on the recent MacBook Pro-ish Intel ad that sparked a wave of speculation that Intel may have accidentally leaked the nextgen MacBook Pro redesign. Apparently liquid metal is a lot darker than aluminum, thus the near-black appearance. It’s pretty nice looking, don’t you think? Mockups are fun, especially when they’re based on little bits and pieces of rumors. You can see one we did of the iPhone 5 and iPhone Mini based on rumors that an iPhone mini will use the same iPhone 4 screen. Debit card is ready, build it Apple! For a Macbook Pro to be that thin. NO optical drive and NO spinner hard drive. “ala” most current gen Macbook Air. We’ll see what come down the pike…. Intel did not accidentally leak the ad. Apple gave them permission to do so. This way, they could create excitement for a new design. Apple knows what they are doing when it comes to marketing. New design looks pretty cool. The bezel just looks like wasted space to me that they could be using. The bezel contain important features such as: the webcam, the light sensors, etc… So they can’t get rid of it like you mentioned but yes, they could try to make it smaller if possible. Papai, olhe a maravilha que estar por vir!!! Material desenvolvido pela NASA, 20% mais leve do que o alumínio, além de ser mais resistente. Arrombeisonnn!!! i highly doubt that this is the design of the new macbook pro. if they were going to ditch the unibody look, this rendition looks exactly like a current model macbook pro, except a darker color and a missing superdrive. really, it looks like a thinner, darker macbook pro, if you look at it for a while.